Narryna’s art collection includes works by CTH Costantini, Knut Bull, Robert Hawker Dowling, Paul Dowling, John Woodcock Graves, Louisa Ann Meredith and unidentified British and Tasmanian 19th century artists. The collection was developed through the personal and family associations of the museum’s founders and therefore contains many portraits. Charles Buckland arrived in Hobart with his wife and family in 1841 and was employed in the Audit Department until 1871. He was the uncle of the Rev. J. R. Buckland of the Hutchins School. His daughter, Elizabeth was first wife of Sir Valentine Fleming who was Chief Justice of Tasmania in 1854-1869 and Acting Chief Justice 1872-1874. This portrait is one of a ‘family’ of four portraits of three generations of the Buckland and Fleming family, similarly framed. Robert Hawker Dowling arrived in Launceston aged 3 years old with his father, the Baptist Minister, Rev. Henry Dowling. Following art studies with Frederick Strange and Henry Mundy, he set off for London and was the first Australian artist to have a professional career in Britain. Six days after Anne Harbroe arrived from London with her parents in 1838 she married Dr John Coverdale MD. In 1840 Dr Coverdale became district surgeon at Richmond and in 1865 Superintendent of the Queen’s Asylum for Orphans at New Town. Nine years later in 1874 the Coverdales moved to the declining penal settlement at Port Arthur where Dr Coverdale was appointed the last Civil Commandant before its closure in 1877. It was at Port Arthur, a little over a year later that Anne died. 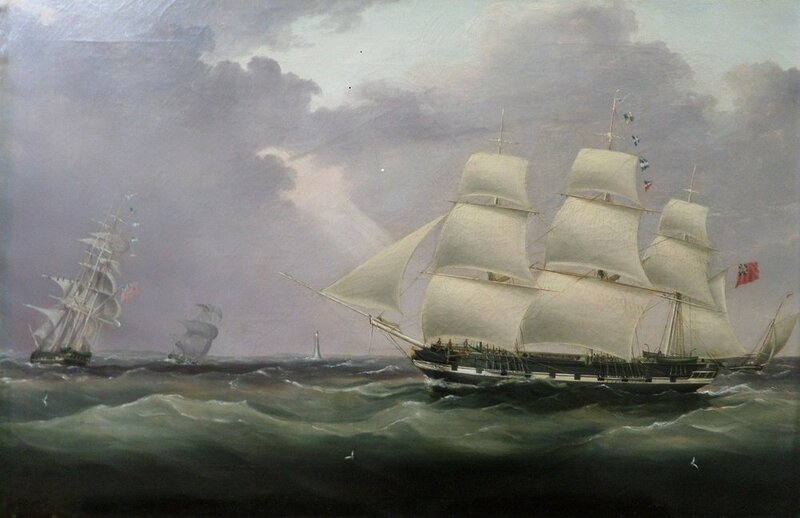 This ship ‘portrait’ was probably acquired or commissioned by Narryna’s builder, Captain Andrew Haig when he acquired a half share (with his uncle, Jacob Mills) in the Sir John Rae Reid in 1832. The painting was probably acquired by Sir William Crowther from Captain Haig’s daughter, Fanny Reid. Crowther is believed to have presented the painting to the Ship Lover’s Society (a forerunner of the Maritime Museum of Tasmania) which was based at Narryna 1955-1974. Speedy voyages between Tasmania and England in the 1833-35 period marked the high point of Captain Andrew Haig’s reputation as a mariner. Haig’s wife Elizabeth and three of their children accompanied him to Tasmania on the outward voyage of the Sir John Rae Reid in 1833. The ship was central to Haig’s success but as recession hit the British colonies and trade decreased, Haig’s uncle, Jacob Mills, repossessed his half-share in the vessel, bringing the Sir John Rae Reid back to London in 1839 to travel on the trading route between London and the West Indies. This marked the turning of the tide in Captain Andrew Haig’s fortunes.